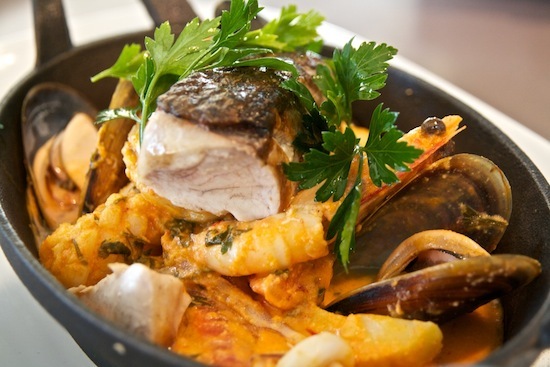 Our braised seafood romesco is based on an interpretation of a traditional Catalan Fishermen Stew (Romesco de Peix); a comforting and warming rustic seafood dish featuring a selection of beautifully cooked Australian seafood. It is a great way to eat seafood in the cooler months, however you could also use the romesco sauce as a salsa for barbecued meats and seafood, as they do in the spring time in Catalonia in Spain. This wonderful dish is currently featured on our Autumn menu at Garfish Crows Nest. Roast red capsicum in a hot oven, then place in a bowl and cover with glad wrap and allow to cool. When cool remove skin and deseed with a knife. Blanch roma tomatoes in boiling hot water for 30 seconds then refresh in iced water. Remove the skin and cut tomatoes into four wedges. Heat the oil in a frying pan and fry off the garlic, chilli and sourdough till golden in colour. In a food processer blend the fried ingredients with almond meal, half of the roma tomatoes and the roast capsicum. Slowly add the lemon juice and chicken stock. You should have a thick cream consistency. This can be made prior and left in the fridge for up to three days. In a heavy, wide based sauce pan heat the oil and fry off the mussels, prawns and calamari and season. When seafood is starting to colour add the romesco sauce, reserved roma tomatoes and pre cooked potatoes then cover with a lid and turn down the heat. While your romesco sauce is cooking with the seafood above; start to pan fry your white fish (we complete the cooking of the Blue Eye Trevalla in the oven just prior to serveing), give your romesco sauce a stir and check on shellfish. When both the seafood in romesco and the larger piece of blue eye trevalla are cooked (i.e. mussels are open, prawns are a nice white colour and your calamari has curled) remove from heat. Divide your sauce (with ingredients) evenly into four serving plates and arrange your grilled white fish on top; serve with some fresh lemon cheeks and grilled bread and garnish with the parsley and a drizzle of extra virgin olive oil.